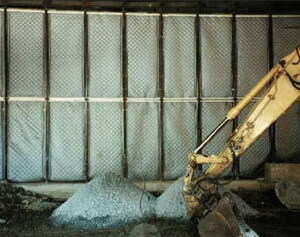 Sound Seal ® Quiets "The Big Dig"
It’s called “The Big Dig”. Boston’s Central Artery and Harbor Tunnel project is the largest highway construction job ever undertaken in the United States...at a cost over $11 billion dollars. This section of the Central Artery Project utilized (420) Sound Seal BBC-13-2” Acoustical Curtain Panels to significantly reduce construction noise. . . .
One sensitive issue of such a significant project is how construction noise will impact local businesses and residences. 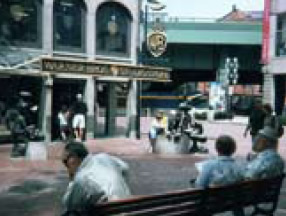 Quincy Marketplace, a unique, open-air collection of restaurants, shops and offices, is located adjacent to a section of the project requiring working underneath an overhead highway, while a densely populated residential area is located on the opposite side. Thus, the noise impact upon the Marketplace and residences is even greater from the direct construction noise as well as the reflected noise off the deck. Neva Associates, the local Sound Seal distributor, working in conjunction with the Noise Control Division of the Central Artery Commission, determined that Sound Seal BBC-13-2” Acoustical Curtain Panels would offer the required noise reduction. BBC-13-2” Acoustical Curtain Panels are a combination of a 2” thick vinyl-faced Quilted Fiberglass Sound Absorber and a 1 lb PSF reinforced loaded vinyl noise barrier. Modular panels are constructed with grommets for attaching to the framework as well as exterior grade hook and loop fasteners for joining adjacent panels together. Sound Seal manufactured and shipped over 400 such panels within a three-week period. 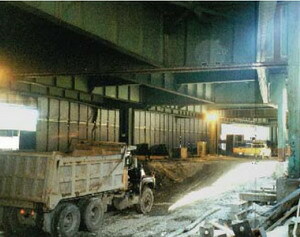 Many other sections of the massive project have also utilized the Sound Seal Curtain Panels with even better results because they were not located below a sound reflective overpass. A common treatment is to have the Sound Seal Curtains installed on fence posts inserted in the pre-cast concrete highway barriers. 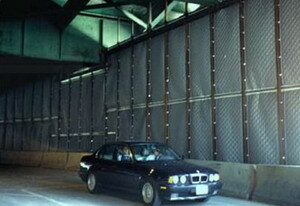 This allows for the noise reduction treatment to easily be relocated along with the highway barriers. These are just a few examples of how Sound Seal Acoustical Products soundproofed “THE BIG DIG” construction site. In conjunction with the Noise Barrier/Sound Absorption Walls, Sound Seal has also manufactured a number of portable “Hoistable Curtain Enclosures”. The BBC-13-2” Acoustical Curtain Panels are installed on heavy duty structural steel frames to drop-over jackhammer operations during that phase of construction. The jack-hammer operator works inside the three-sided roofed enclosure to screen that very loud operation from the neighbors. The enclosure is then lifted by crane and dropped onto the next section they are working on. By combining a sound absorber with a noise barrier at construction projects such as these, the Sound Seal Acoustical Curtain Panels offer noise reduction for construction workers as well as serving the primary purpose of keeping noise levels at a minimum in the neighborhood. Below is a chart showing the sound transmission loss and sound absorption data for the BBC acoustical curtain panels.